Gun rights advocates and student protesters at the Capitol on Monday argued over possible legislation to remove guns from people deemed dangerous and to mandate safe storage of firearms. The hearing was held after Gov. Greg Abbott requested legislators look at gun and school safety after the fatal Santa Fe school shooting. Those were John Kappelman’s closing words to lawmakers who gathered at the Texas Capitol on Monday to examine potential legislation on gun storage and “red flag” orders to remove guns from people deemed dangerous. Kappelman, a recent Austin high school graduate and local organizer for gun control group March for Our Lives, was one of more than 100 people who came to testify at the hearing sparked by the fatal school shooting in Santa Fe last month. Gov. Greg Abbott last month issued a 43-page school safety plan and asked the Legislature to look at laws that could improve gun safety — including controversial calls to examine legislation that would regulate safe gun storage and a potential red flag order to allow law enforcement, and sometimes family members or other parties, to ask a court to order the temporary seizure or surrender of guns from people who are deemed dangerous by a judge. 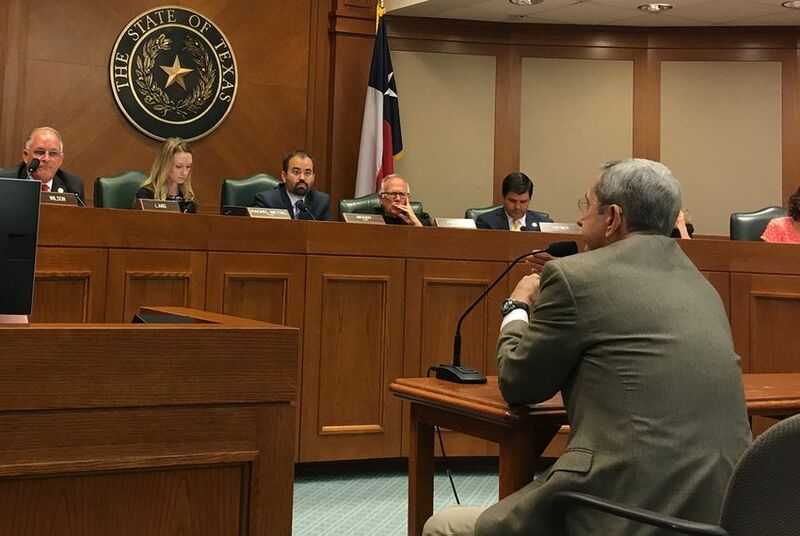 The House Criminal Jurisprudence Committee held its first hearing on those issues Monday, spending hours hearing from students, judges and advocates on both sides of the gun debate. More than 100 other citizens signed up to speak, many of whom restlessly stirred during the day-long hearing and occasionally interrupted with heated comments. The divided audience loudly applauded both student organizers like Kappelman who demanded more gun control and those speaking against potential legislation. Those against any red flag legislation spoke of progressive or unethical judges, who they claimed would too often take away guns from innocent people, and disgruntled family members or divorcees who may wrongly seek the order. They also said existing laws, such as protective orders in family violence cases or involuntary detention orders for those with mental illness, were adequate measures to combat future violence. “I do not want to see an error made and some hard-working, law-abiding citizen of Texas go through the devastating procedure that a court proceeding can put you through,” said Gene Dolle, a constable in Upshur County. Red flag laws vary state by state, so it’s hard to say what a Texas law would look like. Generally, the laws work by allowing a party — often law enforcement — to ask a judge to remove someone’s guns because they believe the person is an imminent threat to themselves or others. The judge can then order that the guns be immediately seized or surrendered, and a court hearing follows within a specified period to determine whether the guns should continue to be held or returned to their owner. Texans who are subject to existing protective orders are already banned from possessing firearms during the lifespan of the order. But unlike those orders, red flag laws don’t require a crime or past act of violence for a judge to order the surrender or seizure of guns. Since the February school massacre in Parkland, Florida, which took the lives of 17 students and staff, more and more states have begun to adopt such laws, and even the National Rifle Association released a video promoting such laws, though with very specific restrictions. Alice Tripp, a lobbyist with the Texas State Rifle Association, said her organization believes current laws and orders are adequate in addressing red flags and child accessibility to firearms. She asked Abbott at a roundtable discussion he held the week after the Santa Fe shooting what was missing. “I can’t see anything missing in current law,” she said. State Rep. Joe Moody, an El Paso Democrat and chairman of the committee, countered that the lack of enforcement is a gap that judges and prosecutors mentioned. Currently, gun surrender under these orders is largely voluntary, with the exception being a few courts that demand the surrender within a set period of time before setting an arrest warrant for contempt of court. Though the hearing was focused on both safe storage of guns and red flag laws, the latter dominated conversation. And despite the loud opposition from gun rights groups, multiple Republicans appeared more open to a discussion on working to implement a type of red flag legislation than trying to pass a law mandating gun storage. Patterson added that safe gun storage would be better handled with an education campaign than a law. State Rep. Matt Krause, a Fort Worth Republican and member of the conservative Freedom Caucus who sat in on the meeting, also said he believed there was a way to pass a red flag law that ensures due process. For Mercedes Stone, however, gun storage is an issue to fight for, despite what may be a lack of political will. She lost her brother, Chris, in the Santa Fe shooting last month, and she partially blamed the shooter’s parents for his death.